Best Friends Diva Days and our Annual Locks of Love Event! Lots to Love at Shear Madness in February!! $15.95 Diva Days for Daddy Daughter Dates in February! Comes with FREE Princess Tiara!! All Diva Days this month include a sparkly hairdo, mini manicure, little girl face makeup and a FREE Princess Tiara! 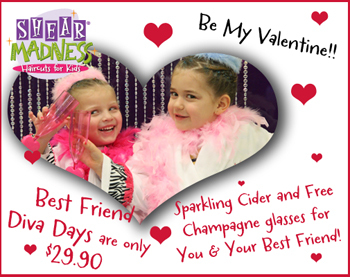 Shear Madness will ALSO be offering a very special Valentine's Diva Day for Best Friends that includes champagne glasses and a sparkling toast at the end! These are absolute favorites - so schedule your little divas their special day today! By appointment only Please book your appointments in advance. COUPON Clips - Click HERE to get Awesome Coupons! During the month of February we will be holding special braiding classes in all of our salons. The braiding classes are SO much FUN and great for a mommy and me afternoon or daddy's who don't know how to do their little girls hair. Classes will last approx 1 hour - Our stylists will teach different braiding techniques and each girl will leave with a fabulous braided hairstyle they can then do at home! Just in time for the school holiday dances! Sign up sheets will be in the salons or call to register for a class. See your store for days, prices, and more details. 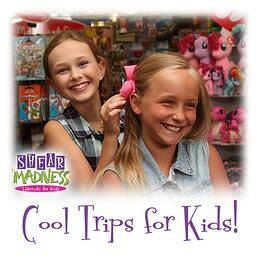 Our New Shear Madness Models!! We are happy to announce the WINNERS for the Shear Madness San Antonio Model search! Thank you to all the awesome kids who participated in our San Antonio Model Search. To join in future contests and online sweepstakes from Shear Madness visit our facebook fan page and like us. Lots of fun events are happening all the time! We are bringing back the oldies in 2013! This year we will bring back our DAILY Dynamite Deals! There's something for everyone, so come in and save BIG any day you wish! Military Monday : $3 off haircuts if you or your spouse are in the military. Wacky Wednesday : Get a COOL kid's hair cut INCLUDING colored spray or colorful cool hair feathers!! Thrifty Thursday : Bring the WHOLE family and get $1.00 off second child, $2.00 off 3rd child, and $3.00 off your fourth! Freaky Friday : $4.00 off our Father & Son haircut package. Shimmering Saturday : Bring in a friend that’s new to Shear Madness & you BOTH get $3.00 off your service! Super Sale Sunday : 10% off selected merchandise. Check out some our favorite local businesses on our business partners page! These are some of our most favorite local businesses who have partnered with us to increase exposure, awareness and build quality clientele!. If your business is interested in an advertising partnership with Shear Madness then WE WANT TO TALK WITH YOU! Our Winners for the month of January were: Sarah Graham, Dayna Hill, Misty Mann-Johnson, and Sommer Saunders! Look for our Free Haircut Friday contest every Friday morning on our facebook page!